Blogging is a great way to have freedom of expression. You can talk about what you would like in the way you want to. There is no one there to tell you what you can or cannot do. Or is there? Even though you own your site, there are still many legal issues you need to know to make sure you understand. Ignoring these could potentially land you in hot water. When it comes to blogging, many people do it so they can work for themselves. There is no one there telling them what they can’t do or say. There is freedom in not only working for yourself but also in expressing your thoughts and ideas. There are disclosures and things you cannot and should not do when it comes to producing content on your site. 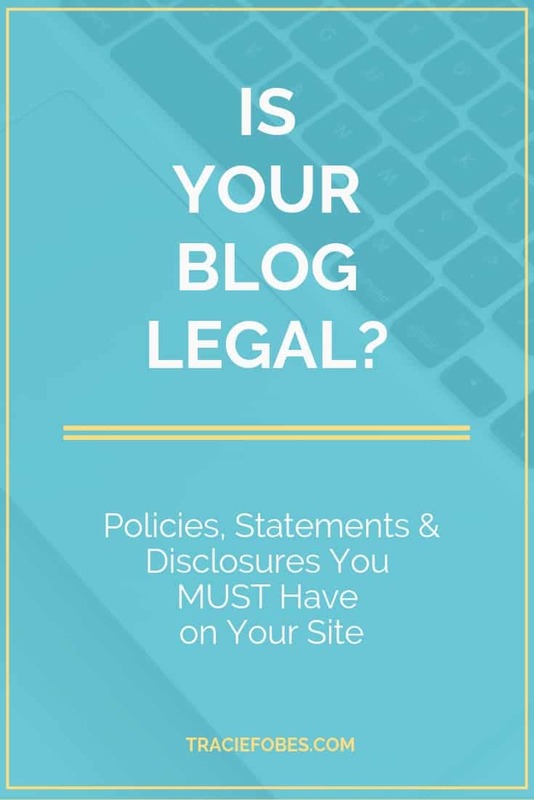 Before you make another blog post, make sure you have covered the potential legal issues. A blog post usually does better when there are images included in the content. And, if you use Pinterest or Facebook, using great images is even more important for marketing. But, you can’t just use any image you find online and add it to your blog post. You need to know that you have the rights to use it. There are many free sites where you can get images to use. While using something free sounds like a great option, it may not necessarily be the best idea. Unfortunately, there are times where images are uploaded to free image sites without the photographer’s permission. If you use one of these on your site (even with attribution), you are liable. That photographer can sue you for illegally using an image. Rather than buy them, it is better to purchase through a reputable website. You can use something like DepositPhotos.com, 123rf.com or Adobe. When you purchase through a reputable site, you have proof that you purchased the rights. If something comes up, you have proof to show where you found the image. A popular type of article written by bloggers is the round-up. These are list posts where bloggers share links and images to other sites on a particular topic. I’ve done many of these on Penny Pinchin’ Mom, as you can see in this article about 16 Dollar Store Organizing Ideas. Bloggers do these articles so they can share a concept without having to write the entire article and take their own pictures. They can do very well on Pinterest and social media because readers really love list posts. And, if you include bloggers in your article, those same people may be more willing to share it with their followers as well, getting you more traffic. As great as they are, there is one thing that many bloggers do incorrectly. They use the image from the other blogs on their site without permission. Those images are not yours to use on your site without asking first. All images are the copyright of the person who took them. When it comes to recipes or DIYs, those images are taken by the creator of that content. They may not want it anywhere but their website. You can’t put it on your site without their OK. Even if the image is stock photography, you still cannot use it without permission. First off, you have no idea where that image came from whether it was purchased or stolen from another site. If it you use it without consent, you are now liable for using it as well. Not only that, but when someone buys an image, the rights allow them to use it on their site – not for anyone to take and use as they see fit. If you want to do one of these posts, reach out to the blogger and ask for permission to use the image. You may also find a blanket statement on their site that states you can use an image as long as you give attribution and a link to the article for a round-up post. While most will happily grant this to you, there are some who will not. You are liable for all images on your website, so ensure you have the rights to use them. 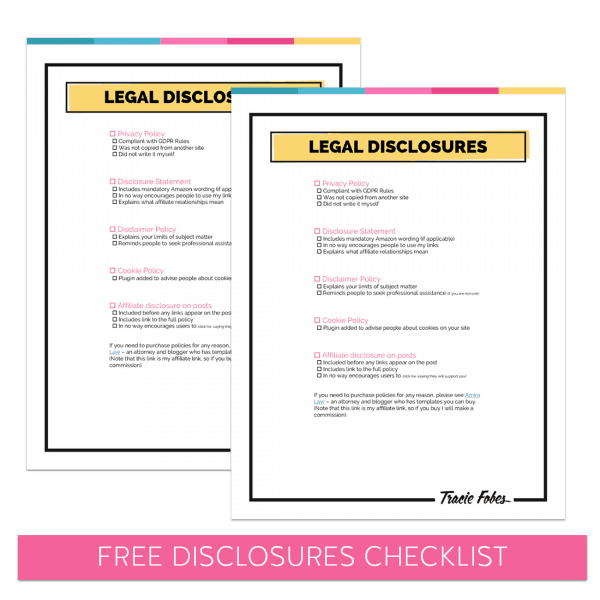 Your blog must include several different disclosures. These are required not only by Google and affiliate partners but may be a legal requirement for various states and countries. For instance, the European Union passed the GDPR, which was a massive privacy law. Even if you do not live in that country, if you have visitors who do, you must comply with their laws. You can expect more states and countries to pass similar laws. California passed one that goes into effect in 2020. So, if you are in the United States, you will have to comply with California law for your visitors from that state. So, what do you need to have to make sure your site is legal? I recommend you place the link to your policy in your footer (do not use your main menu nor put it under your contact or about pages). It just needs to be there so readers can see it. However, it does not need to take up valuable real estate. When it comes to creating your policy, do not ever copy, paste and edit a policy you find on another website. First off, you do not have permission to do so and secondly; you do not know if they are really in compliance or not. It is better to find a reputable website where you can create a policy you can use. Your disclosure statement is where you explain to your readers how you make money. It shares the relationship between you and any of the links and partners you promote. It just tells them that you may make money if they happen to click and buy through your link. If you are an affiliate with Amazon, you must also include their mandatory wording as stated in Section 5 of the Terms of Service. It is important that you follow their terms and update it accordingly. Once again, do not copy and paste someone else’s policy that you may find on their site. You need to make sure that you create one for your website, so you know you are in compliance and have the proper legal statements included. Check out the online legal bundle that you can purchase for your site. Your policy gives people the full information regarding the monetary relationship between you and the partner you linked to in the content. But, you must alert people that there is that relationship on your post. The Federal Trade Commission has made it very clear that this notice must happen before any links happen on your blog post. You can put it below the title, before the content or even directly above the link itself. It does not matter, as long you are very clear. Your statement can be as simple as “This post contains affiliate links. 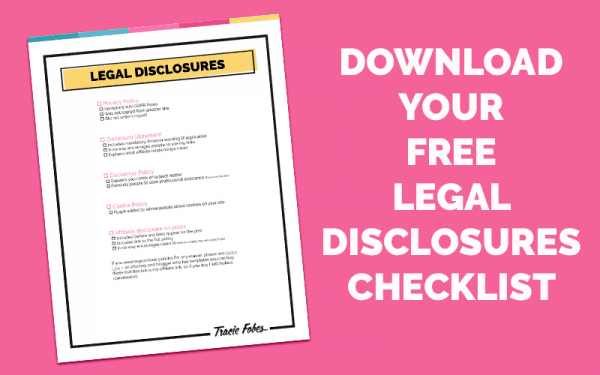 Please click here to read my full disclosure policy,” with a link to your disclosure policy. That’s all you need. One thing you have to be careful about saying is that you appreciate them supporting you by using your links. This language is not allowed by Amazon and can result in removal. Rather than have a different statement to use on various posts, it is best to have a blanket statement that can work for all of them. If you have affiliate links or a sponsored post, then you must include this disclosure. 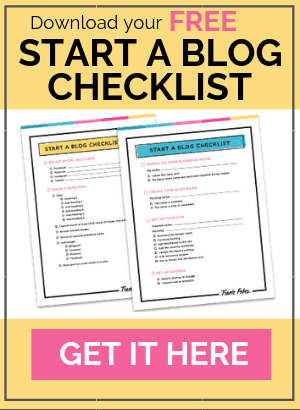 Rather than be go into this in great detail here, I recommend you read more about the disclosures you must have on your blog. One policy that some bloggers tend to leave off of their site is the disclaimer. Your disclaimer basically says that you are posting information and links in good faith and are not attempting to allude or misguide anyone. It pretty much just means you are honest. It is important to include links to both internal and external content. By linking to other related posts, you signal to Google how the articles relate to one another. By linking to external sites, you signal Google and your readers that the link you are showing is good and should be trusted. That is why linking is important and should be done so thoughtfully. When you give someone a link, you give them “Google Juice” telling Google to consider this a link that should be trusted. That, in turn, can help them get better rankings. The thing is though; Google does not want people paying for links. That is a big no-no. No one can buy their way up in ranks, or everyone would do it meaning only those with deep pockets will get onto page one. Google wants good content to rank, so it wants to ensure that people don’t pay to play. That does not mean you can’t get paid for your links. Not at all! But, when you get paid to place any link where money exchanges hands, such as a sponsored post or affiliate link, you must ensure that the link includes the no-follow code. That tells Google that you are linking to this site, but you do not want it taken into consideration for ranking. Google ignores the link. Using no-follow links ensures there is a level playing field and you aren’t buying your way up in ranks. Not using them can result in a manual action against your account, which can lower your site’s visibility on Google. There is a lot to consider when it comes to using follow vs. no-follow links. Make sure you understand the difference and when they should be used. While it should really go without saying, you can’t use someone else’s content in any way on your website. That is plagiarism. Even if you are using it to add value to your post, you should not do it. You can, however, include a small quoted excerpt to someone’s site, and add a link to the full article on your own. Doing this gives the reader insight as to what the other party has said about the topic, without copying and pasting the entire article. You may find that some sites steal full articles and place them on their own. This is called scraping. And it is illegal. If you find a site has done this to you, research to track down their host and file a DCMA notice. This tells the host that this person is using your content illegally. The host will assist in taking down the material and sometimes, even the entire website for theft of content. 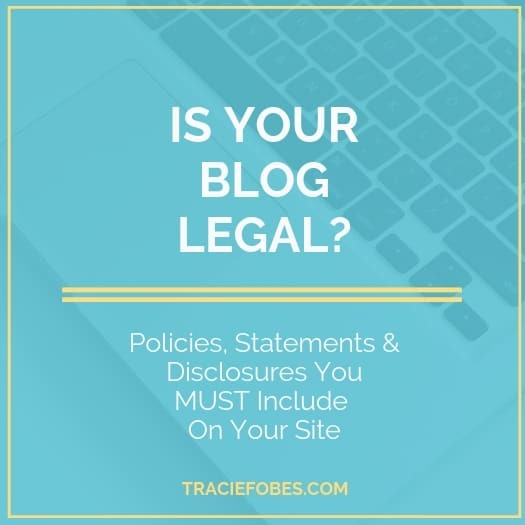 Keeping your blog legal is up to you. Don’t let it discourage you from blogging, but rather, encourage you to do things the right way. *Note that I am not an attorney and is this information in no way, to be construed as legal advice. You should consult a licensed attorney for specific questions and concerns. I would buy it because you want to make sure you don’t forget anything. It can average around $125 – $150. Stay up to date with all of my awesome tips!